The Future may seem terrifying if we are to ponder it right now. It is less intimidating when we make the most of the present and embrace the future for whatever it is. People tend to worry about the past and future. They rarely think about being in the moment. What happened in the past 6 days has been the result of that. Of living in the moment, freeing myself from any ridiculous expectations of how people should be, what the places are like or why we do things a certain way. The future to this is up in the air and to be honest, I forgot it was a competition from day one. All we did was enjoying ourselves, opening our minds and hearts to new things, experience the dream we never thought of and laughed because that’s how we were feeling. 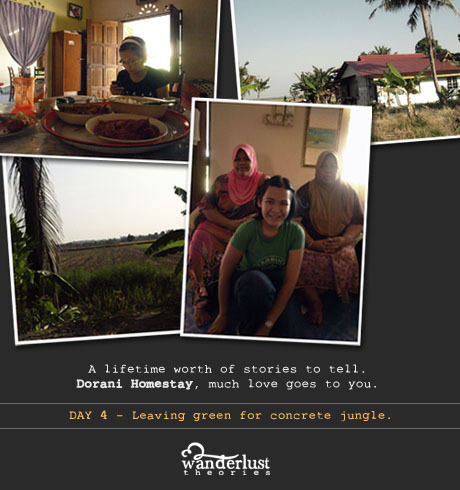 If it’s any consolation, the entire MySelangorStory trip itself is like a grand prize on it’s own. One you’ll have rare opportunity to have again. So, whatever I wrote in my previous entries were purely how I felt not because it was competition and I had to do it. Instead, it was my way of giving back to others and hope it keeps spreading around. That way everyone will be able to have their own version of MySelangorStory. Since Amelia extended a little bit of time for all of us to finish up our posts, I had some time to experiment with iMovie after 6 years of not touching after college ended. Indeed, I had to go through the tutorials to learn how to make one. Ah, the noob in me has finally emerged again. I used the theme from iMovie thinking it fits with the look I’ve been achieving and I must admit, it is cheating so it’s ok that I don’t qualify for a video category 🙂 I had a blast going out of my comfort zone making it for fun anyway. 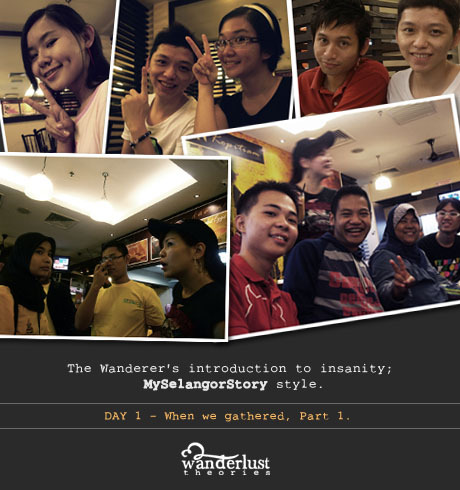 Day 6 actually ended after our dinner in Haven because the morning after, everyone didn’t get to say goodbye to each other as one was sound asleep *stares at Victor* or have an early flight to catch like Alid, Kemal and Citra. Followed by Chia Li, KK, Fadli and Sy. 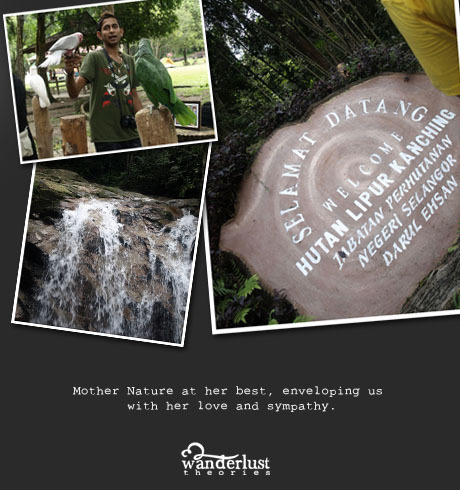 Others were either hitching rides from their family, friends or Tourism Selangor‘s crew. So there wasn’t much to report except for feeling somewhat sad for MSS to end. Quite the eccentric bunch we all were during this tour. A giant family moving about together. One that will be told for many many many years to come I’m sure. Somehow, I feel this trip is only the beginning to something more. Voice out, I’m all about sharing thoughts and if this deserves a vote – simply click MySelangorStory/TheBeginning. It’s been said too often that where there’s a beginning there is an end. I like to think only this chapter has ended and new one is in the works. For some of us, this is like an adventure of a lifetime, others an opportunity to mingle. For whatever reasons it may be, I don’t think it could have been done any better. 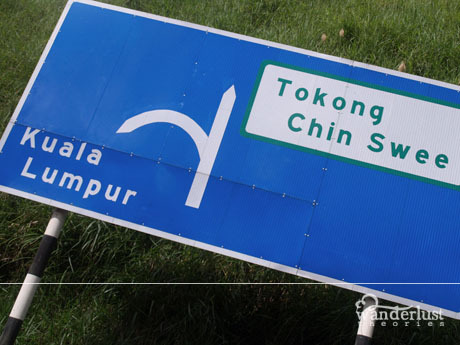 Ok, that part probably can do without the worst jam in Klang Valley – Taman Tar’s traffic jam. If you must go to this area during peak hours, I advise you to study the alternatives to avoid this mindless traffic jam. If possible, avoid at all cost; especially during Ramadhan. Yup, you got it right. 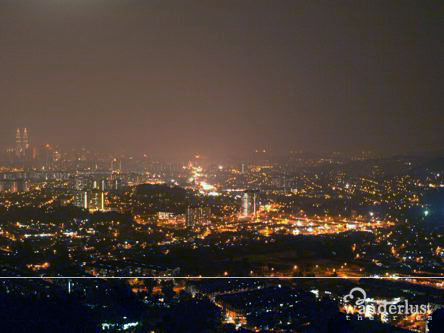 Our final destination for the grand dinner was at the top of Ampang’s Lookout point. The one place where I find solace in at night if there’s a need to get away from the city’s rush. 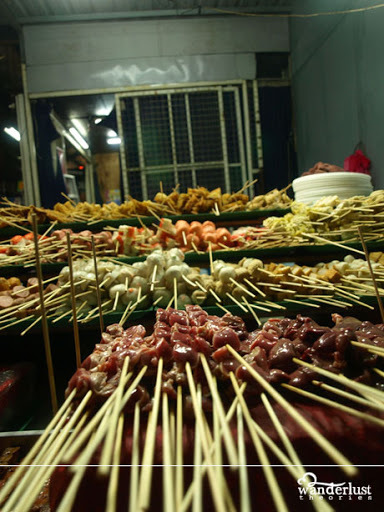 And also to indulge in the food stalls by the brink of the lookout point. Despite the many times I’ve been up here, this was my first time to go to Haven Restaurant. After all, there’s always a first for everything right? 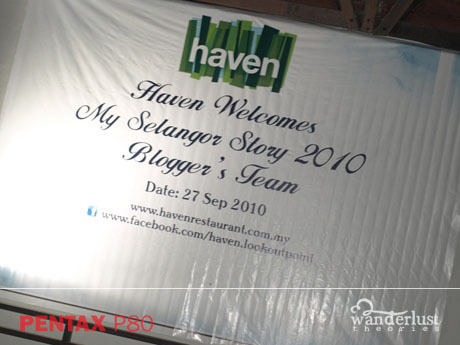 The moment we arrived at the entrance, we were embraced by all of Haven’s staff! There were photographers taking our pictures too! To this fifth day, I’ve yet to get used to this sort of treatment. As we walked further inside, we saw this hanging on the building across us. 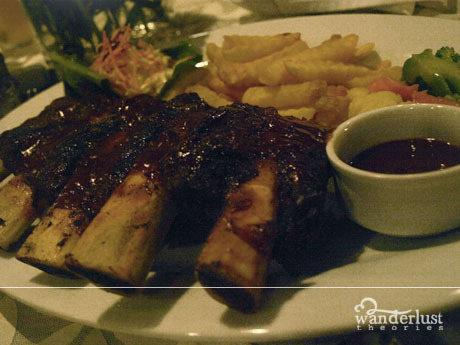 We were also taken away by their preparations for this Grand Dinner that we were late for. We felt really guilty for holding them back because we were told Haven closes at 10pm. Nonetheless, they were all smiling and receiving us warmly. We signed our name on the guest book and were given (our 6th) goodie bag! This must be what those celebrities go for when there’s events around eh? We came here because of the view too! I think there was a good reason why we were late. Had we arrived as scheduled, we would be basking in the coldness of the heavy downpour and would not be able to see the skyline at all. 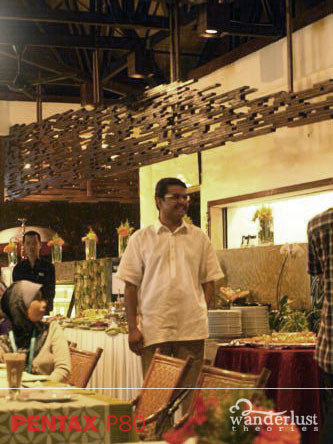 As part of this grand dinner, Encik Anantharaj Appanan, the Managing Partner for Haven Restaurant gave a welcome speech to all of us. Hey, it was a pretty nice feeling to know that people around have recognised the power of blogging (although where I come from, it’s called the dinosaur blog era). It was really good, being here with everyone. When we arrived, we were given a menu to choose our main course. The entire list sounded so delicious, it made me indecisive for a moment. Not to forget, a long list of drinks to choose from too! 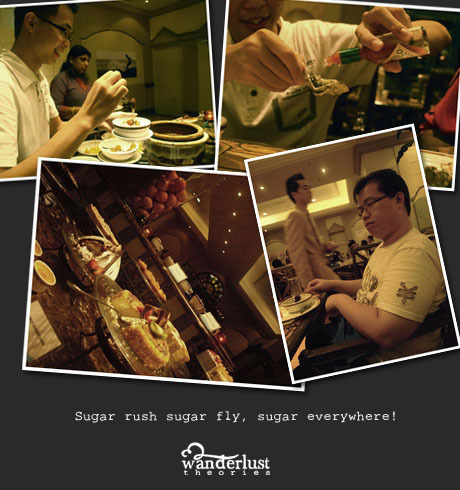 After we ordered our main course, we headed to the buffet appetizer and desserts. 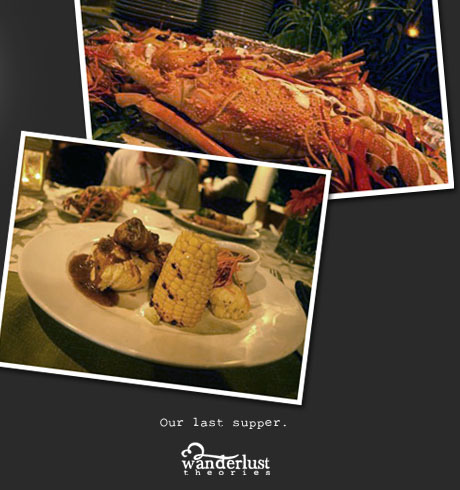 When you know there’s Lobster Thermidor waiting for you to feast on, you’ll do whatever it takes to not delay it. Otherwise, there won’t be any left for you. The very dish many who are close to me know I’ll go crazy for. 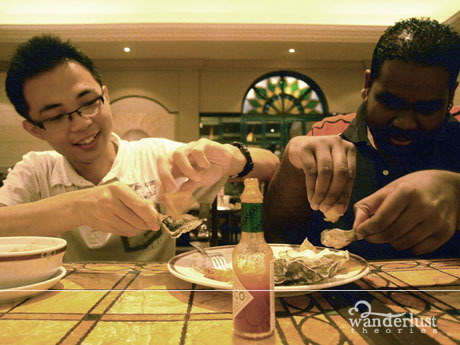 Just as we were picking out the various appetizers on the table, Haven’s waiters served our main course as well. So what does this mean? Full speed ahead when eating! My chicken chop was super yummy, that portion alone took me a while to finish. 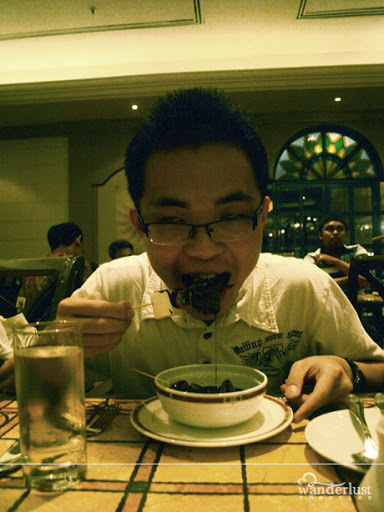 I can’t imagine what I’ll be like if I had ordered the ribs! I think even Kings won’t be able to finish this! Just look at the portion. It’s an amazing race on it’s own. Why? Because Sy, Max, Thristhan and Dylan who were sitting on our table decided to have a ribs battle among themselves. You should see how the battle started! Now this is what I call food fest! Heck, Dylan and Thristhan even went for second helping of the ribs. It must have been finger lickin’ good for them to feed themselves more even though they were already full. We were also entertained by One Night Service solo Razlan Saharuddin, Kak Ning, Hafiz and Wen Yi (I didn’t get to take your photo!) throughout the night. The best part was when Kak Ning took the mic and took control of her audience. Even Haven stopped in their tracks and listened to her tongue-in-cheek comments. She should be an emcee on the side too. We laughed, we sang, we smiled, we cheered, we took (a lot of) photos and we celebrated. Haven couldn’t have been any more sporting than to wait for the dinner to end towards midnight. Kudos for that! We were very fortunate throughout this journey to be able to enjoy what we normally wouldn’t have stumbled upon. And here we were, making memories that will forever be embedded in our minds. Oh, there were more goodies for us to bring home before we left Haven – mooncake by Casahana and an umbrella from Haven 🙂 More reason to hit any strangers who tries to do anything fishy. Hehe. Not to mentioned the vouchers Haven sponsored for the 10 of us too! I’m sure this is not the last time we’ll be here. That night, I think none of us wanted the night to end. We lingered on the deck for so long hoping time would move slower than usual. Alas, everyone will have to go back to reality the day after. Starting with Alid‘s super early flight. He had to leave us all at 6 AM and we didn’t get to say proper goodbye. The many times I’ve been to the lookout point, it has always given me good memories. It started of as one and this grand dinner will only add one more into the collection. It was a very merry MySelangorStory Monday for all of us. Oh! 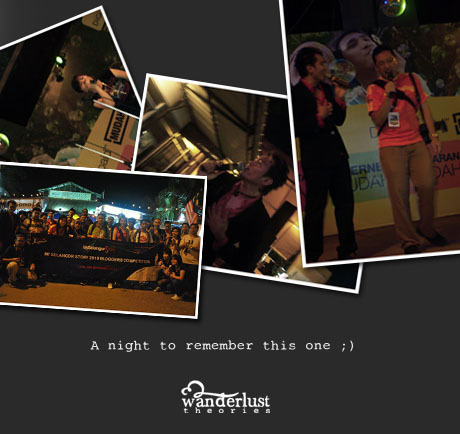 Before I forget, I’d like to thank Tourism Selangor crew for driving us up and down that night! The things they did for us 🙂 Everyone’s just awesome! Wee. I would love to hear what you have to say or if you like this post enough to vote it, head over to MySelangorStory/GutenNacht. 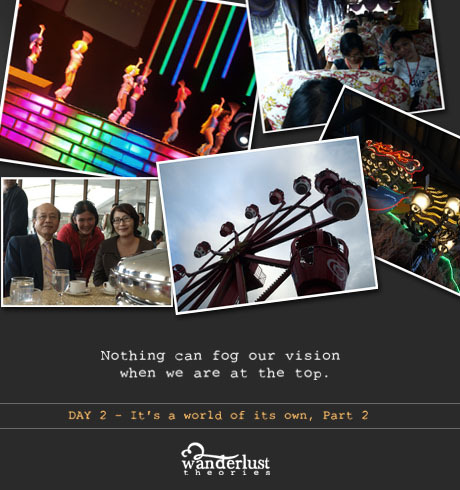 The weather in Genting Highlands reminded me a lot of Haarlem during summer. Except, it’s a tad more humid. The best part of sleeping at night over there is the fact that I don’t need the fan or air conditioner to keep me cool. All I need to do is open the windows and let the cool breeze breathe in my hotel room. Something I often do back in my house when the temperature goes down. Maybe that’s why I felt a lot like home in First World’s hotel room. Or it’s just a combination of everything. I will probably never know. But what I know is that, every trip I make, I’ll always discover something new about myself. 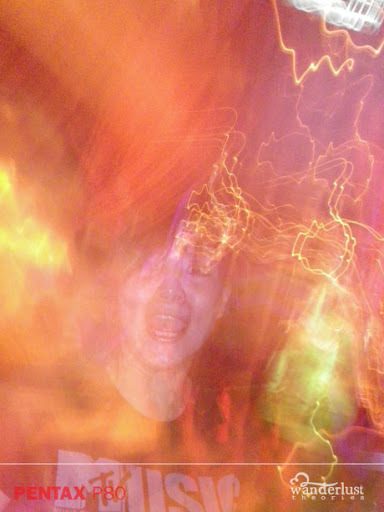 Every time I walk out of an experience, I bring with me a new theory. 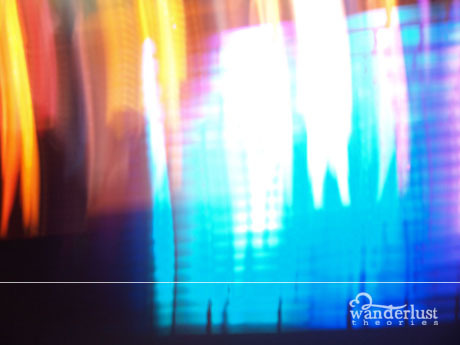 I never quite explained how Wanderlust Theories came about. And I think the above sentence pretty much explains it. Theories in life are meant to build our character, hopefully strengthen our principles and eventually nurture a deeper faith between you, life and God. So spending my first ever night in First World (usually I’ll stay in Awana because my dad loves to golf), awaken the kid in me – to simply be me, enjoy whatever comes and ultimately have simpler beliefs. Waking up to this view was unbelievable to say the least. To have breakfast with this view every morning is even more incredible! But that was exactly what we did the morning after. We were treated to World Club Lounge breakfast which I was told is where the very special people are invited to eat. Well, what was it that I usually say..? Live the moment? Yeah might as well live it while we were given the chance. I suppose if you have all this modern techs to help you out, might as well use it. Depending on it is a different story. Oh look who woke up as early as we did just to see off? A certain french speaking mime. I think Charles is from Cayman Island. One of the islands in the french colony. Also, Kak Zara has a secret crush on him 😛 Haha just kidding Kak Zara. 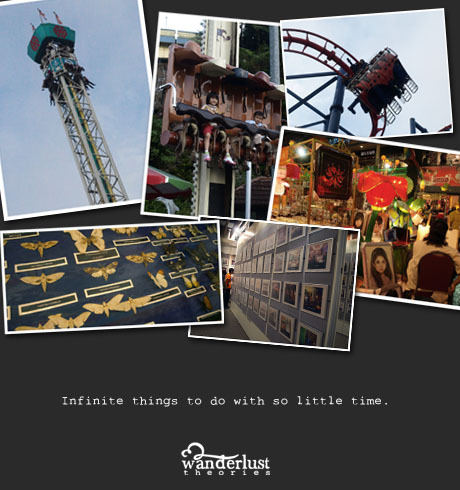 With that, another page flipped over regarding Genting Highlands for this trip. It was really thoughtful of Resorts World Genting representatives like Mr. Philip to send us off as well. Of course, we’re not bidding adieu just yet (since we still haven’t spend our points)..so we’ll make a return. Possibly a whole group of us again, who knows? 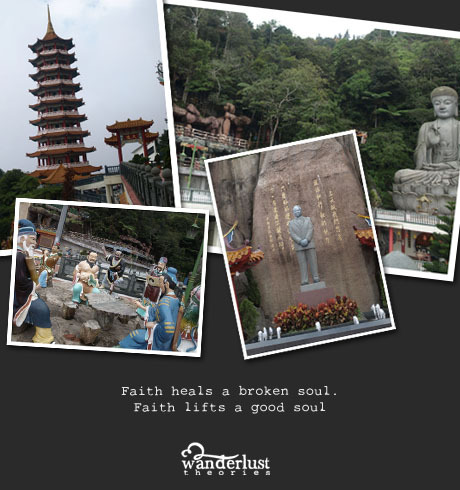 Mr. Philip and Dato’ Anthony Yeo had recommended us to visit Chan Swee Caves Temple. We were told by Dato’ Anthony Yeo when he was giving out his speech the day before that this particular temple was build on a very difficult platform, therefore back in the days men could not use any machines to help build the temple. So they had to do it manually. Why did the late Tan Sri Lim Goh Tong chose this spot to build something on a difficult terrain? Apparently this is the area most strategic to view Genting Highlands. There you go! Visiting this temple again finally put the curious cat in my mind to rest. Why? All this while, I’ve been having this image in my mind about standing at a chinese temple somewhere high up but I couldn’t remember where this place was. Imagine how annoying it was to recall a memory half rendered for more than a decade! Then it hit me, I had visited this temple when it first opened back in 24 March 1994 with my family who then brought a foreign friend along. This was that place I’ve been trying hard to recall. A major “AAAAAHHHHH” moment right there you bet. There were many beautiful statues standing tall around the area; unfortunately we didn’t have much time to explore every part of this place. It’s really huge. You could even walk up along the pathway to the top if you have enough stamina 😉 A must see place in anyone’s itinerary. 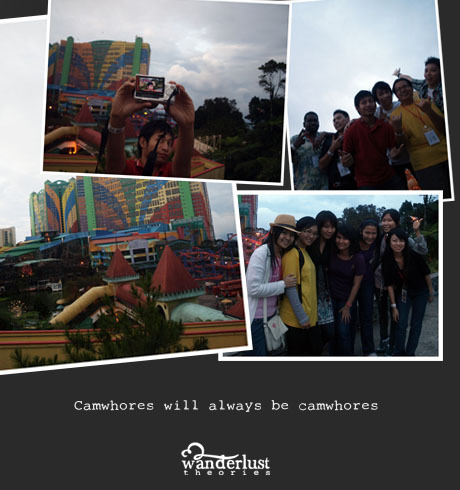 I’m sure there are some of you who wondered why were we in Genting when our tour is about Selangor. Well, Genting Highlands is divided into two between Pahang and Selangor. So there is one part of Genting which belongs to Selangor. 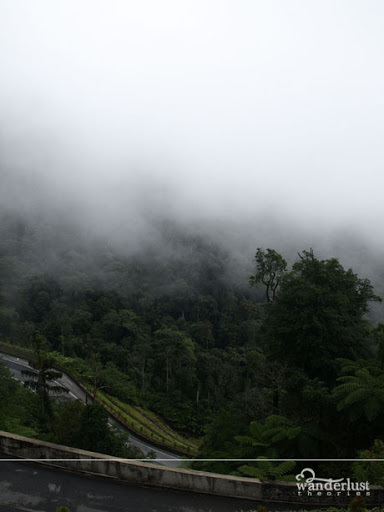 One trip to Genting Highlands from my place behind the zoo takes less than 45 minutes (ok, depending on how fast a person drives), that’s how close it has become since the old days. You don’t get THIS in any other place, because many of us have forgotten about Mother Nature 😦 We have to go to places like this to be reminded what we have lost or is about to lose. So sad. Now that we have finally put a full stop in our Genting pit stop, we went to sleep (well most of us; some took this opportunity to take pictures of those sleeping) for the next 1.5 hours to Rawang. What is there in Rawang? They might as well renamed this very day’s itinerary to “Bonding Session with Mother Nature” 🙂 There are 7 levels to this waterfall, it’s so high up, you’ll be proud to conquer the top without feeling like your knees are melting. Ehem, we only went as high as level 3 and most of us (including moi) were obviously not in shape to go all the way. Nonetheless, the view was breathtaking. The water was refreshing and cold. It’s all you need when you see a waterfall. 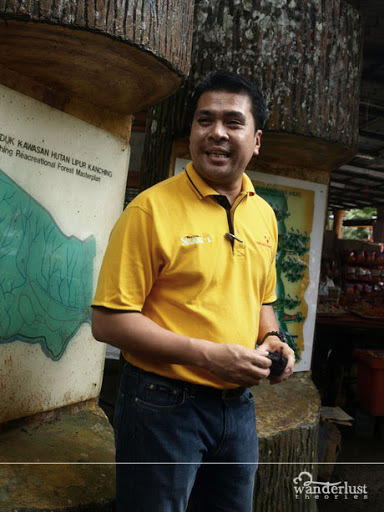 Because this is Tourism Selangor territory, Mr. Fazly briefed us the do’s and don’ts while being here. He’s been working hard to make sure we are good in our space. So the only other thing he reminded us not to do was not to feed the monkeys. For the obvious reason of course. I guess one of us couldn’t help but did it anyway 😉 Hafiz oh Hafiz. Good thing it didn’t follow you home. We ate at the campsite where the tents were. Happily eating our chicken from KFC, then came these rascals trying to take the food away from us. What the monkeys didn’t know (we didn’t either) was that, in Nicole’s past life, she was a monkey slayer. So she pretty much saved the day for us. 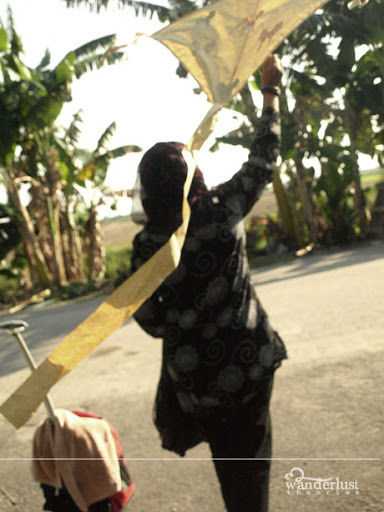 Swatting the monkeys with a rolled newspaper, kung fu-ing the monkeys. Amazingly, it worked! 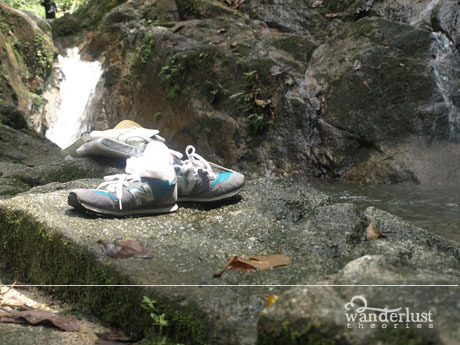 Apart from that, if you do plan to come to Hutan Lipur Kanching, do remember to wear proper footwear. It would be a bit ma fan(tedious in English) to take your shoes and socks off and then put it on again. 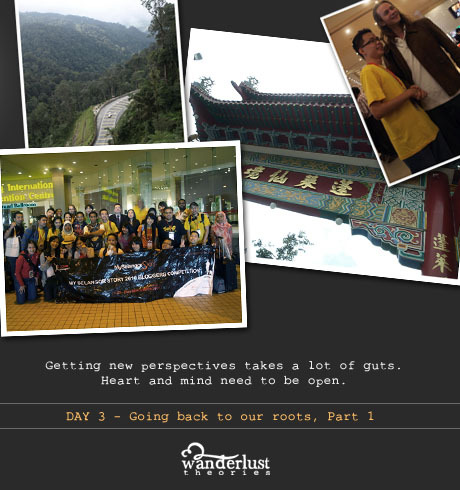 And don’t forget, if you like this post enough to vote, just go to MySelangorStory/The Root of the Matter website and browse through the days. Arigato gozaimas! It’s my first bus ride up to Genting. 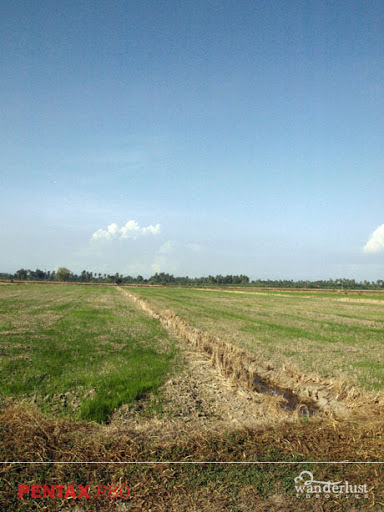 All motion sickness aside, I saw things that I will most likely never get to spot while in the car. Usually I’ll tag along with the rest of the Lotus Club members for a drive up, zigzagging along the sharp corners and bents. One time it spun on wet tarmac up on a hill there somewhere. That was some kind of insanity. 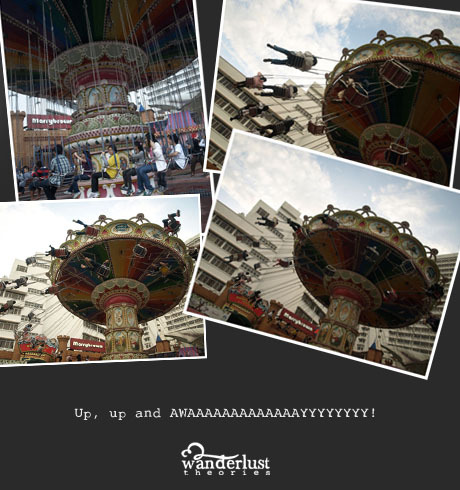 This time, MySelangorStory journey to Genting Highlands may not be as exhilarating with the engines roaring away behind my ears but I assure you, this ride is just as mind-altering. No money in the world can buy this experience. So seat back and enjoy the show I mean entry ;). Let the spectacular story begin, part deux. 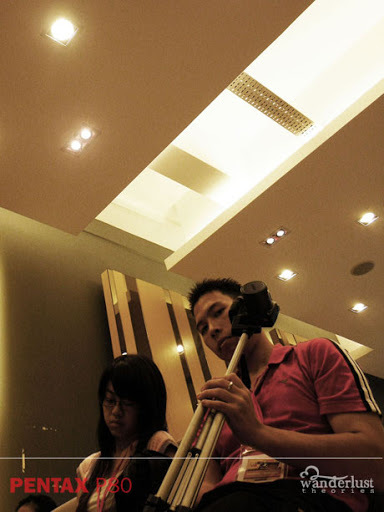 The moment we arrived at Genting Highlands First World Hotel, we were welcomed like Very Important Personnels. 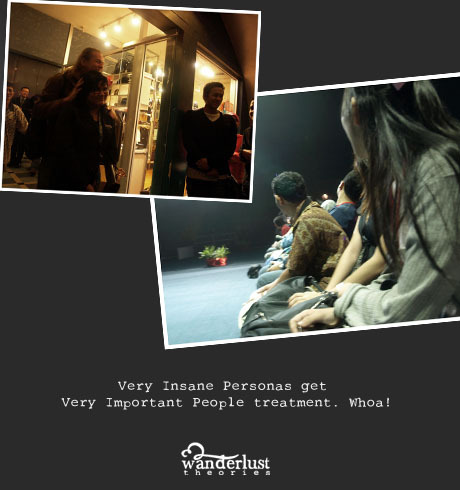 But I like to think it as Very Insane Personas (What? It’s true!). 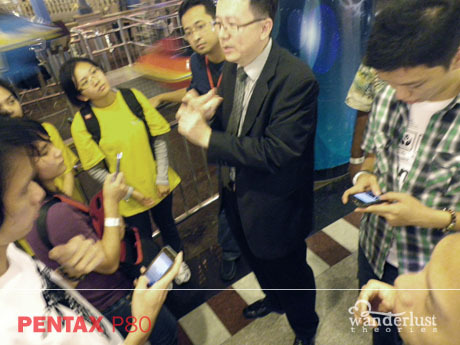 Every Senior Management from Resorts World Genting made effort to be there with us at the entrance. We were all aware about their tight schedules but to know that the Senior Management actually took the time for us made the trip even sweeter than ice cream. Even Tabby and Allie walked with us! Ok I know, why is a 25 year old getting excited over two oversized mascots? To be honest, I’ve watched game show hosted by Genting every Saturday on TV3 more than a decade ago and the closest I’ve seen them (if it weren’t for television), it would be the statues placed in front of Wisma Genting at Jalan Sultan Ismail. So it’s been, you can say a childhood dream of mine to see them. Being able to take photos with them was enough to fuel me to jump over the moon I tell you! I must admit, I have a 200 year soul in a 25 year old body with a 5 year old heart. Err.. does that make more sense? Nevermind. 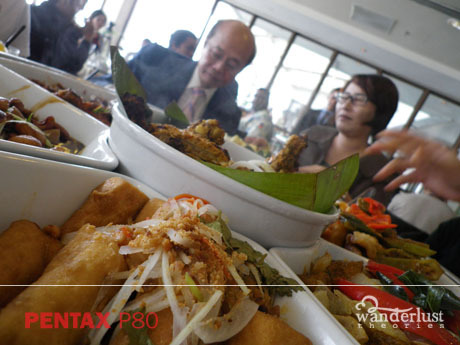 We were then ushered over to Maxim’s Club for our much awaited luncheon. Boy were we glad to see the food… the desserts were so appetizing, it’s a sin. 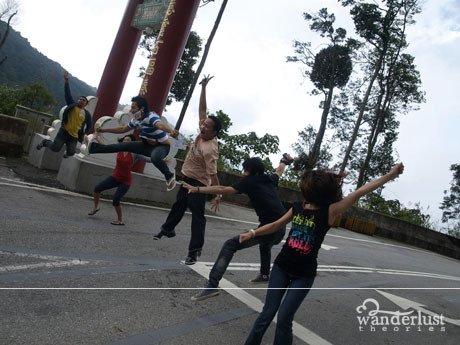 Don’t you just feel the love we were embraced by Resorts World Genting? Sigh. Never in a million years did I saw this coming..ever. Seriously. 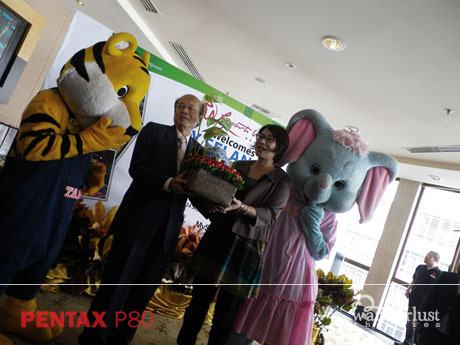 Both Dato’ Anthony Yeo, Senior Vice President of PR & Communications and YB Elizabeth Wong gave a speech each, telling us how Genting first started off as a dream that came to the late Tan Sri Dato Seri Dr. Lim Goh Tong. See, every place we go, everyone we know will somehow have a story to tell; whether it’s about themselves or the events they’ve seen. Everyone has a story worth listening to. By a stroke of luck, 7 of us were picked to dine with Dato’ Anthony Yeo and YB Elizabeth Wong. Lady luck must be in a good mood as of late. Oh. 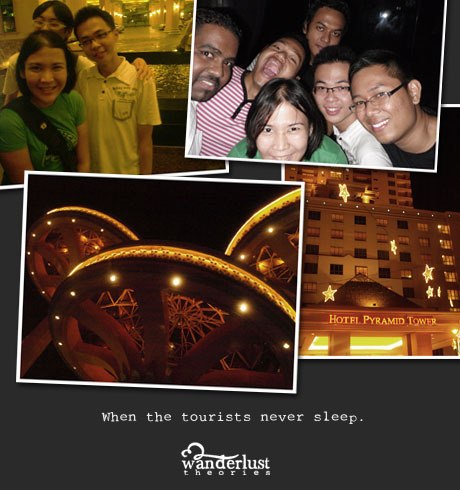 And each of us were given an all day pass to outdoor/indoor theme park, 10k worth of WorldCard points (RM100), RM100 worth of Holiday Card, One night stay at Superior Deluxe with View in First World Hotel, VIP Access to Dazzle and breakfast buffet at World Club Lounge. Indeed we were spoiled rotten. My jaw literally dropped when Mr. Philip announced it to us. Resorts World Genting, you sure know how to welcome your guests. Hands freaking down baby! 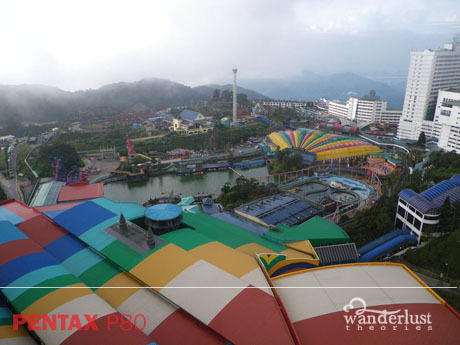 Back in the 90’s when Genting wasn’t what it is today, things were much simpler. There’ll be butterflies hanging on the wall of the souvenir shops but today, they have Galleria where guests can learn the history behind Tan Sri Dato’ Seri Lim Goh Tong’s vision. A remarkable visit. 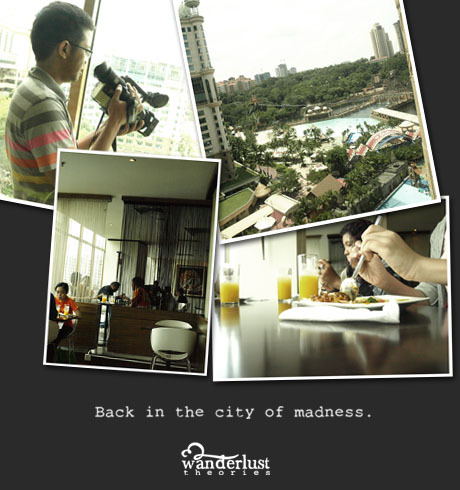 Sooooooo…..with RM200 in our pocket and a pass to make use of, there’s only one place we planned to go. That’s right. Theme park! After 5 years, I have finally come to terms that as much fun and exciting theme parks are, I am just not really a big fan of them. I love theme parks but not so much when it comes to extreme rides. How did I know this? It went all the way back in London when a friend told me upfront that it’s not worth it for me to spend money to any theme park since I don’t go to all the rides. Perhaps it’s the society we are brought up in, everyone loves theme parks. Everyone enjoys the fun feeling that comes with it. In away theme parks are usually associated with letting loose and to some it goes as far as freedom. And as we grow up, some of us would love to be part of that society rather than being different. Being a non-conformist, I therefore will have to bare the consequences of missing out some of the happiness that theme parks bring. I do however enjoy bumper cars 🙂 Just anything not scary basically. Haha. True, you can throw me into the track doing stunts with a car or a muddy slope with an ATV, heck throw in some dangerous waves for white water rafting – I am scared to death about roller coasters (and horror rides). I’m totally cool being hit hundred of times with a paintball rifle but I can’t for the life of me bungee jump. Indeed, I am a weirdo and I’m proud of it! This ride caught my eyes for it’s very colourful ceiling 🙂 not brave enough to go on the ride. I like to observe. Participating in this feels like my heart is being snatched with bare hand. Ouch. When the theme park closed at 7pm, we went to the top of the hill and took scenic photos of this wild resort. I don’t remember it being this colourful at first. I must have not been here for the longest time. 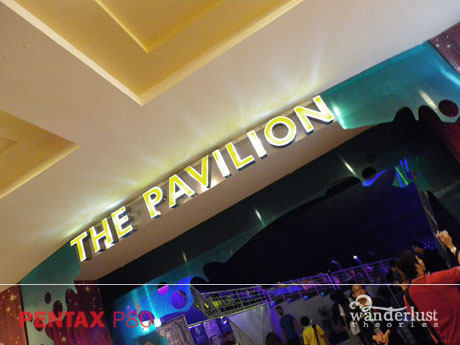 The schedule for the night was for us to meet up at The Pavilion by 8.45pm for the Dazzle show. It has the circus feel from outside looking in. In reality, it’s like an auditorium.. sort of. There we were briefed regarding this VIP access we were given. 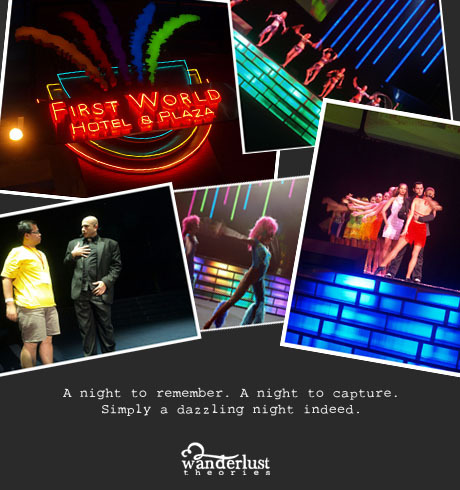 Never before had they granted any special pass to guests for their shows yet we managed to get this one time only opportunity to take photos during the Dazzle show. At first we were allowed 15 minutes to snap but Mr. Philip then allowed us to take throughout the show except for a few shows like Statue of Jerome Murat, The Invincible Man & Hand Shadow. 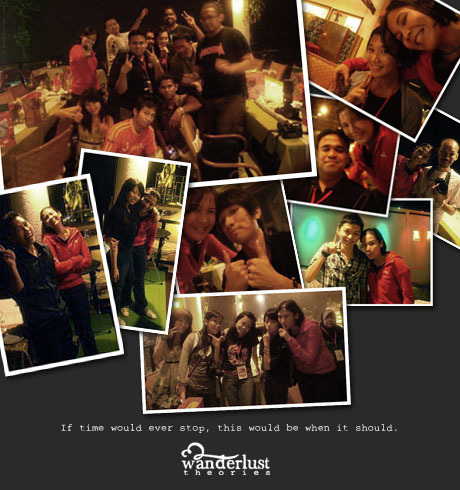 Apa lagi (Malay for what else)..we took our cameras and snap snap snap snap snap like there’s no tomorrow. What’s Dazzle! about? It’s a 60 minute show with several different segments to entertain us including the Statue of Jerome Murat from France, award-winning magician Ernesto Planas, Sonny Fontana the hand shadow master and Duo Presto, the quick change illusion act. We were given front row seats and Spectre, who sat beside me was picked by Ernesto to take part in his magic show. Hehe, dude looked clueless but everyone had fun! When we had to sit in front, my heart was beating so fast, it felt like it was about to jump out of my body because I knew one of us will be invited to be part of the show. As much as I love the unknown, I am just as nervous about it. All this could not have been possible if it weren’t for Resorts World Genting support as well as Tourism Selangor, MySelangorStory and Amelia. We even got the chance to meet Charles Gluck who was the mime behind Statue of Jerome Murat, even if it were for a brief moment. French really trademarked the art of miming. After full day of doing all kinds of activities, we finally head back to our own rooms. You read that right. All 26 of us were given individual rooms to stay. Madness! Excuse the mess in the photo below but among the many hotels I’ve stayed, this is one room I really felt like home. Maybe it’s the warm lit room, perhaps the mustard colour featured wall (which many pointed out when they visited my room). I dunno. All I know was that, I was really really reaaaalllllly enjoying this room all to myself. It’s cooler with the view of the theme park outside too. And all this for free. Oh wow. So how shall I sum my day in Genting? Only one photo can speak for me. 🙂 That’s it folks. That’s Day 2 Part 2. 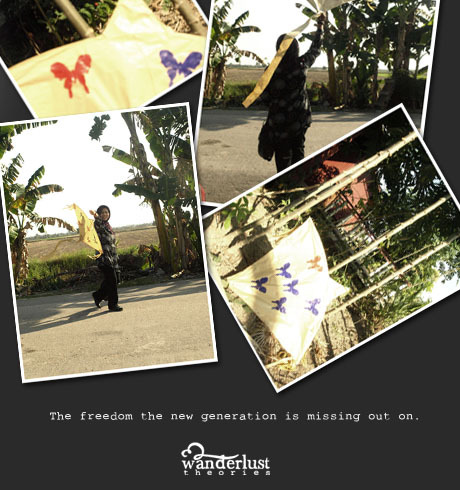 If you like this post, head over to MySelangorStory and vote it. What could possibly be better than this on our Day 3? That’s for me to know and for all of you to find out! What were we doing there you might ask? 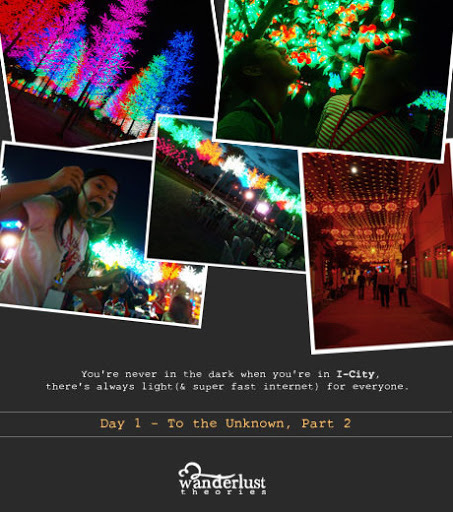 Well, the plan was to dine at i-City. But little did we know, they had set up the dining area in the middle of the digital of lights park for us, and wouldn’t you know it, the only other person who had dined in that same spot was the Sultan. Truly, we were welcomed like kings and queens indeed. Let’s not even talk about feasting like one yet! After the presentation about the developments of i-City, it made me realise that Selangor really plans to move forward with technology as it hopes to be the IT hub for everyone. What with the exceptionally fast internet speed, I couldn’t think of any better reason not to drop by here. Oh wait, there is one other good reason actually. But we’ll get to that stage later. Hey, one can dream right? Oh, we have so much to catch up with the rest of the world! 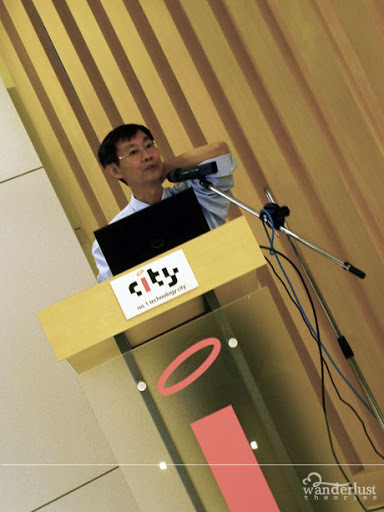 After the short presentation by the CEO of i-City, Mr Eu Hong Chew, we then were adjourned to our dining area which was at the park. I’ll tell you one thing about myself that the world already knows – I’m a sucker for steamboat. 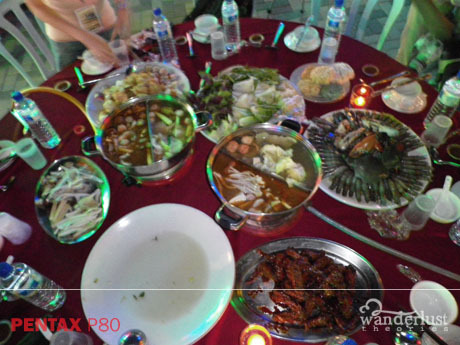 When we went to the our tables, we found out that they were serving us seafood steamboat. Double joy! God, you should have seen the size of ’em crabs. Goodness. It was huge..and juicy too. Yummeh. I could still remember the taste of it 🙂 After all, what is Malaysia without good food right? But that didn’t stopped us from moving about around the park. It was too inviting to not explore! You know, the whole time I was there, there was only one song that was played in my mind and I thought it fit so perfectly well as their anthem. U2 – City of Lights 🙂 I think that will be my official i-City soundtrack. Being here in i-City got me thinking how amazing it can be in the years to come when they have completed this project. As of right now, it’s still in an infant stage but with the right dedication and ambitions, I think it’ll be a leading hub indeed. 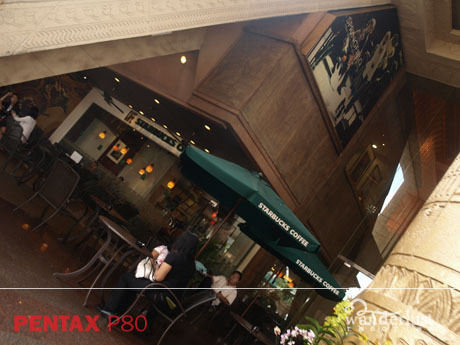 Hello, free wifi with fast internet speed is enough to lure you in (especially if you’re staying nearby). Best part about this place would be the LED lights surrounding the park in all shapes and forms. 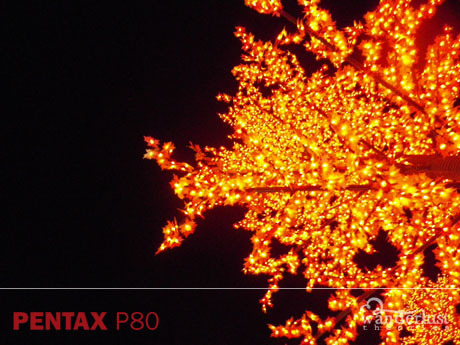 Hence the Digital Lights park. It does have the whimsical feel to it. Although, I’m not sure what T-Rex was doing at the end of the park tho o_O. 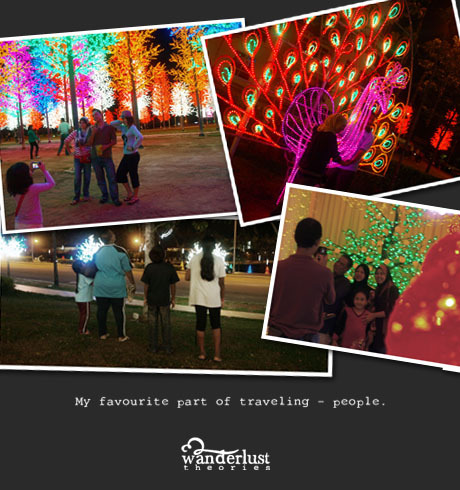 In a nutshell, this park caters to all ages – young and old; a place you have to visit at least once in your lifetime. Just so you know, the park opens from 8pm to 4am everyday. FINALLY, Malaysia has a park to call it’s own without worrying about being caught or have curfews. Since it is new, the entire place is still what I like to call a prototype. At least for now. There’s a small scale snow room for everyone to wander around. This room will eventually has it’s own section somewhere in the park in a bigger scale – think Mines Wonderland’s Snowland. Yeah something like that. Brrr..
As usual, wherever I go, it’s usually the people that I love observing. They make an interesting subject to ponder on ‘cuz you’ll never know when someone you don’t know can make your day by doing something you didn’t expect. So, it’s really no surprise that a lot of my photos I took consists of other people. And it’s only in Malaysia that I’ll get refused when I asked for permission to take one’s picture. At least that’s what happened when I approached one of the visitors at the park. It was my first time being rejected for a photo but that didn’t deter me from taking other people’s photos. Then I saw this group of girls happily posing in front of (assuming) their favourite band. They were such a sport! I couldn’t help but intrude in their comfort zone. Of course this time, I had improvised my approach (actually I was misunderstood) as they thought I offered to take their photo with their camera (which I did) and then I clarified about my true intention. Luck was on my side since they didn’t mind me taking their photo 🙂 Thank you girls! If there’s any lesson I learned from this even it would be not to give up and always find alternatives to do something because there’s never just one way of doing it. 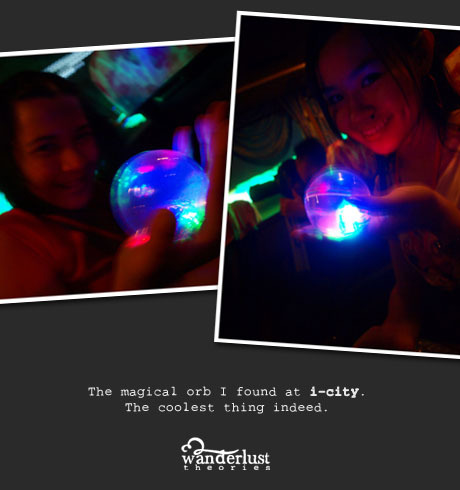 And apparently I wasn’t the only kid at heart around here .. as soon as the rest of the bloggers saw me with this orb, I managed to persuade one of them to get it too. The power of indirect marketing! Heh. Nice eh? 😉 Well, you know where to get it. 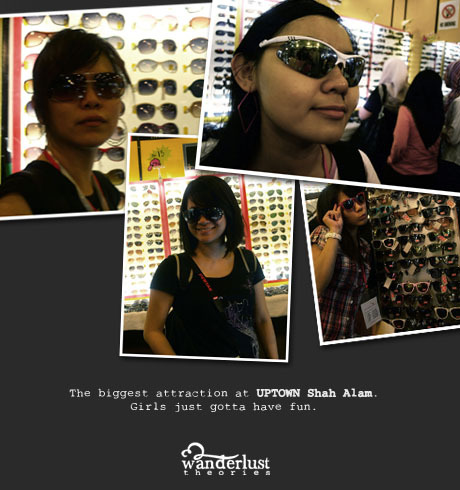 After that, we were brought to Uptown Shah Alam to enjoy the night bazaar at Seksyen 24. 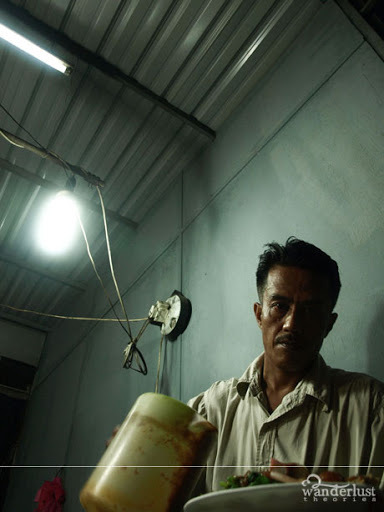 If it weren’t for MySelangorStory, I don’t think I’ll ever know this place ever existed. There were many people outside waiting for us to drop by. For a moment, it did felt like we were some famous people. Wait, En. 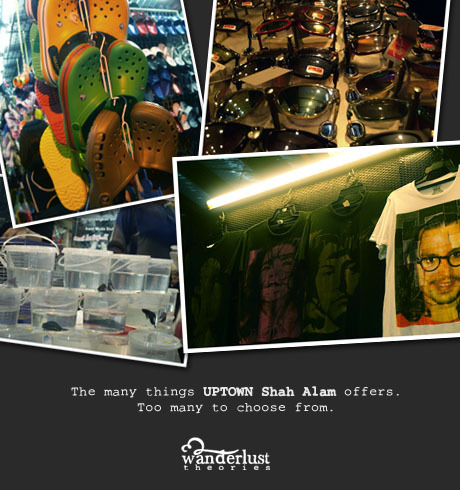 Aizul Hisham explained further about uptown before this night bazaar thing came around, it started off as a funfair. Don’t we just love the ’80s? 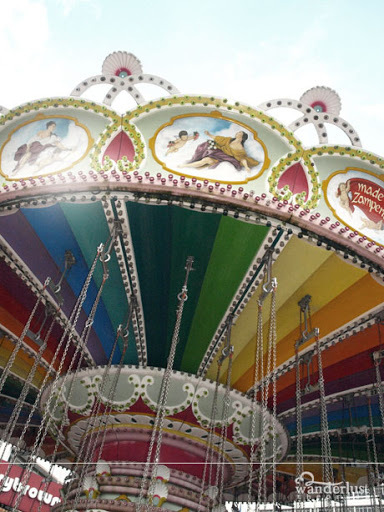 I used to anticipate funfairs when I was younger. I’ll get excited whenever I see Ferris Wheel standing tall. 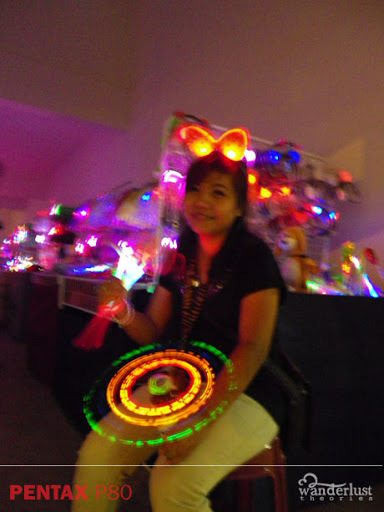 Then in the 90’s it became a pasar malam. Moving to the new era, it is now a night bazaar with sturdy structures for all stalls. Here you can find all kinds of things. Believe me when I said all kinds of things – there’s a shop selling fighting fish in plastic containers and snakes. Jass Cafe was our last pit stop in the bazaar that night. 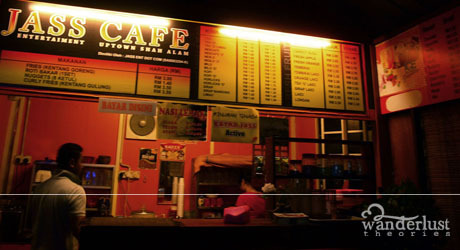 We had some refreshments to keep us awake, at least enough energy to take a look at what Uptown Shah Alam is all about. Always expect the food stalls to be up and running till late because if there’s a business that doesn’t die, it’s the food business. Case in point. It looked so good, I was tempted to get some but..I was too full to eat anything that night. 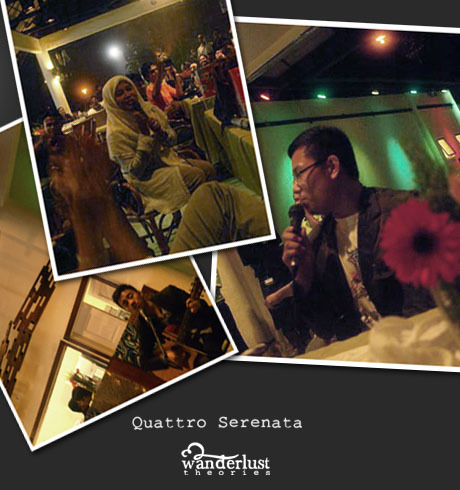 We were entertained by Irwan Shah as well as a local magician in some hidden corner of the area. 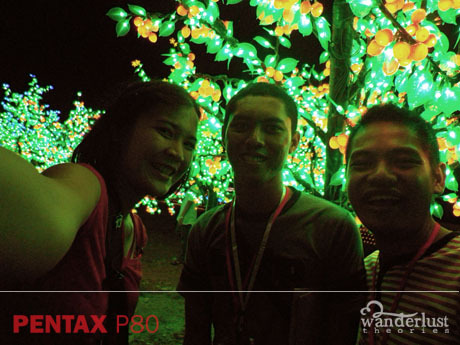 Also featuring two people from our group (names shall not be mentioned :P). Ah, it was a nice way to end the night actually. By the time we reached the hotel it was close to 1AM. And everyone was busy mentally jotting down what to write in our blogs. And that ladies and gentlemen was how we spent our Thursday. 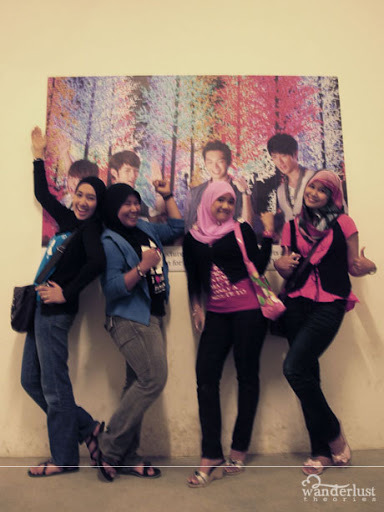 Because we are a colouful bunch of insanities during MySelangorStory tour. I couldn’t think of anything better to describe it. The moment I stepped foot on Subang Sky Park Terminal’s ground, that familiar coming home feeling kicked in. It’s been my childhood playground due to the fact that I spent a lot of my time growing up here. So this event only amplified the sentimental value I have with the airport. Ah, memories. 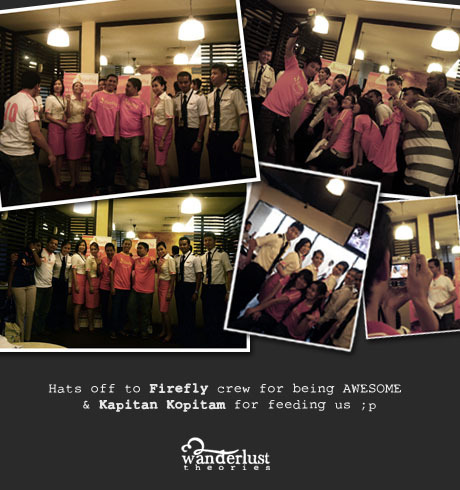 At the entrance of Kapitan Kopitiam, the Tourism Selangor crew as well as Firefly’s crew greeted me with big smiles. That warm welcome instantly calmed my nerves. I couldn’t thank them enough for that. I always think that the start to anything is always the hardest and awkward but the moment all 26 bloggers from Malaysia, Indonesia and Singapore met each other, it was as if everyone had known each other for sometime already. 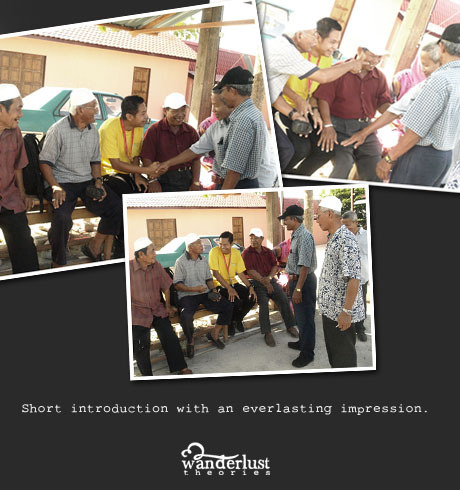 It’s probably because MySelangorStory has helped made the transition for all of us much smoother and easy. Also it has a lot to do with the fact that everyone sort of “ice break” through twitter and emails when the finalists were announced earlier. 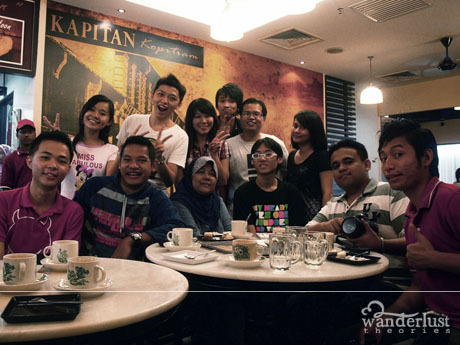 I think Kapitan Kopitiam was a good location for us to sit and chill because we were definitely doing a lot talking, laughing and of course camwhoring. Not to mentioned, they made really good Teh Tarik and some local delicacies to keep our stomachs from growling. What is Malaysia without it’s good o’ Teh Tarik? About 30 minutes later, Raja Sa’adi, Head of PR & Marketing for Firefly kick started the tour with a short speech before handing over Firefly’s jersey to us to wear which then proceeded with more camwhoring. I guess it comes with the territory of being a blogger. The first time when I stood next to a stewardess for a photo shoot, I was taken aback by how spontaneous Firefly cabin crew were as they posed silly with all of us. Even I can’t help but be charmed by their warm personalities and joined in the fun. Yes, me likey. 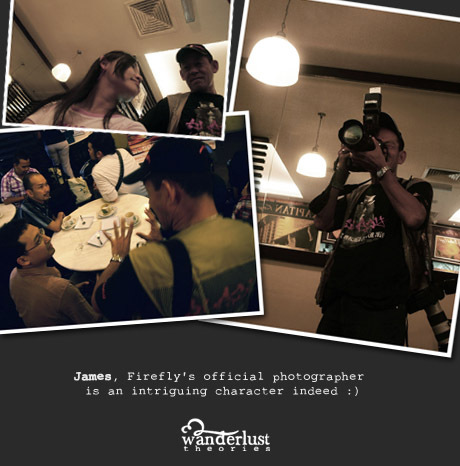 However, the one person who caught my eyes was James, the official Firefly photographer. He is quite the character I must say, so animated. I can tell he is a good storyteller by the way he talked to us. You’ll know a good photographer when one can get the best out of the people and situation; something I keep in mind to practice in my approach when the occasion arises in the future. Thumbs up sir =) You definitely made me day with your witty remarks. Besides, the only way to learn something is by observing how the pros do it. Then, we headed to the bus outside and were greeted by Kak Ning, who I must say is one of the coolest tour guide I’ve come across and standing beside her was Somu, our driver for the day. Since the itinerary was not released yet during the time, Kak Ning informed us that our first stop would be Shah Alam where we stayed in Carlton Holiday Hotel for the night. 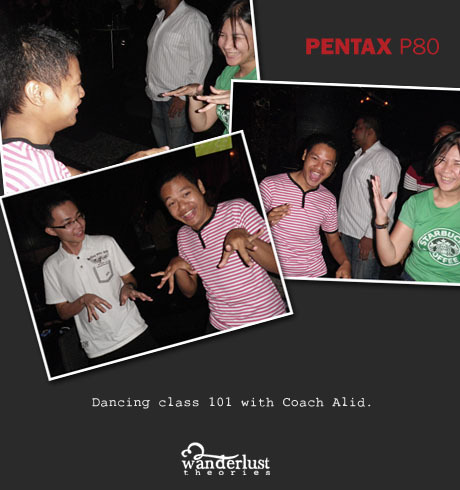 Later, we were sent over to one of the hall for a PENTAX-DSC World briefing. There, Madam Rissa Chan, Executive Director of DSC World Sdn. Bhd. 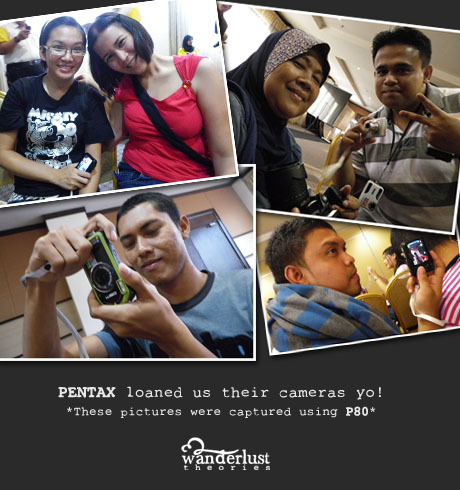 handed out PENTAX cameras for our use during the tour. There were a few different models and I was handed the Optio P80. Right away, we fiddled with the camera and I sure hope Citra (guy with the green camera) will get to keep his Optio W90 because he was so happy when he showed the camera he received to me and Nicole. Yes, Citra – write that advertorial ok? This tour has only just begun and I’ve already learned so much from everyone and everything that had happened. As the sun went down for a rest, we went out to play. Part II will reveal what we did throughout the night.